Our government continues to make progress toward keeping an important promise we made that has implications for the health and safety for your family. The Year Two progress report from the Saskatchewan Surgical Initiative (SkSI) shows we are on track to meet our commitment to provide all patients with the opportunity to have surgery within three month by 2014. We decided early in our first term to make your healthcare a priority and that hasn't changed. The SkSI Two Year progress report shows that 97 per cent of surgeries in Saskatchewan were completed within 12 months. Since the Saskatchewan Party took office in 2007, the number of patients waiting more than 18 months for surgery has dropped by an impressive 91 per cent. These reductions mean real results for Saskatchewan people that were waiting far too long under the NDP to receive the surgery they needed. We have come a long way in the last five years, but we know there is still more work to do. That is why this year's budget we invested $60.5 million to continue to drive down surgical wait times. In fact, this funding will provide more than 4,000 additional surgeries this year. Our commitment to putting the patient first can be further seen in almost $17 million more for the Saskatchewan Cancer Agency which will help pay for 30,000 chemotherapy treatments, 39,000 mammograms and 6,000 new patient referrals this year alone. We have invested $4 million to expand the colorectal screening cancer program province-wide, providing early detection and saving lives. Today, there are 900 more nurses and 200 more doctors working in Saskatchewan than there were five years ago. Today in Saskatchewan, rural and remote areas have improved access to emergency services thanks to our partnership with the STARS Air Ambulance, which started flying the province's skies earlier in the spring. Thirteen new long-term care centres to improve the quality of life for Saskatchewan's seniors are moving forward with planning and construction underway. We have made going to medical school more accessible and affordable for young men and women who want to become doctors and nurses, through our graduate retention and student loan forgiveness programs and increased training opportunities. The Saskatchewan Advantage we talked about in the budget is about more though than just a balanced bottom line. 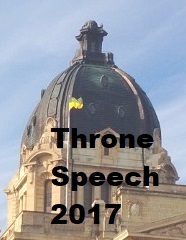 It's about more than growth for growth's sake - it has to be if Saskatchewan is going to retain her place as a "have" province in Confederation. The Saskatchewan Advantage is about improving the quality of life for everyone. It is about taking action to protect the advantage created by your hard work - ensuring our province remains the best place in Canada to live, work and raise a family. To that end, Premier Brad Wall has charged MLAs to go out this summer and consult with constituents and community groups to find out how you think we can best meet the challenges of growth and opportunity. Our goal is to, with your help, make sure the historic economic and population growth we've enjoyed over the past five years continues. What should the government's long-term goals be? What strategies or policies should the government pursue to achieve those goals? What short-term measures can the government take to address some of the more immediate challenges of growth? If you need any further information regarding this summer's consultations, or would like to schedule a meeting with me, don't hesitate to give the office a call or send us an email. Together, we will maintain the Saskatchewan Advantage.